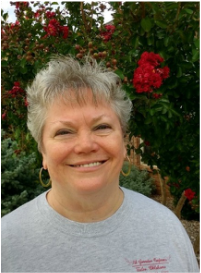 Serving as the Friends of the Tuttle Public Library (FOTPL) board’s secretary is Rose Burrell. Rose works full time as a social worker for the Oklahoma Department of Veteran’s Affairs in Norman, so her time is limited for volunteering at the library. However, both Rose and her husband of 33 years, Kendall, have volunteered to assist with various activities at the library. Rose is a lifelong learner, taking classes often. Sometimes the classes are for her career, and sometimes they are just because it is fun. She says, “Education is wonderful, it has been the biggest piece of my life.” Rose has a certificate in gerontology, because senior citizens are her favorite age with which to work. She has a bachelor’s degree and two master’s degrees from Oklahoma University. Her current license is for a master in social work, but she is also working toward a license in clinical social work. When Rose is not working or taking a class, she enjoys gardening, making beaded jewelry, and creating stained glass. Rose and Kendall moved to Tuttle in 1996 and Rose “just couldn’t believe there was no library.” After seeing in the paper the second attempt to pass a proposition to have a tax supported library in Tuttle had failed, she sought out the citizens who had been working on getting a library for Tuttle. Today, she is thrilled we have the Tuttle Library. Even though she would like to see a tax supported library with more resources for the public and a paid staff to have the library open more hours, she is pleased that our community has the all donation, all volunteer library. She is able to check out audio books to listen to while she is traveling with her job. Kendall’s favorite way to get his books is by downloading eBooks through the library’s subscription to OverDrive where he has access to thousands of books not physically in the library. When asked if there was an area that the library could help our patrons more, Rose replied, “Computers.” The library has nine public computers, and she has seen people come in to fill out job applications online, do research for school, and other activities; but if we had more computers in a larger space, we could have classes for seniors and others on how to use the computer. Having computers for those who may not be able to afford a computer or internet, is vital to our community. If you would like to use the computers at the Tuttle Library or use the Wi-Fi, it is free; it is not required that you have a library card or live in Tuttle. Rose and the other FOTPL invite you to use the computers and to experience the library. The library is books to hold in your hand and read, but it is also so much more.